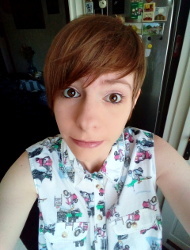 I got nominated for the Liebster Award by Grace from lovingmylit. Which one do you use more: the library or Amazon/bookstores? (Online) bookstores! I mostly read in English an my local libraries don't have many English books, therefore I buy what I need. I've never counted them. Altogether in our flat there are hundreds of books (my father is an avid reader too). How do you organize your bookshelves: rainbow or alphabetically? If you have a Kindle/iPad, do you categorize your ebooks? Mostly I organize it by book size and writer or topic (e.g. : my Shakespeares are next to each other, also I have a collection of books about the son of Napoleon, the Duke of Reichstadt, those are together as well). I categorize my ebooks by genre. Are you on Goodreads? What’s your user name? What’s your relationship with John Green? I love the guy, even though I haven't read any of his books yet. I've watched his and Hank's videos. They are funny and thoughtful. I'm Roman Catholic, although I don't frequent the church any more (I went regularly until I was 18). What’s your favorite kind of cover: simplistic, hand-drawn, or photographed? There are many different things that can draw me in a cover. From these listed above, I'd say I prefer the simplistic ones. Do you follow book ‘trends’? I read what I'd like to read, it depends on my mood, not on the trend. Do you have a local bookstore? Sure, I do. With lots of Hungarian books in it and few English ones. Do you read comics? Do you consider them ‘books’? I want to start reading comics. I haven't read any so far. I might start with Saga, because the art seems pretty in that one. And yes, I consider them books. Have you ever bought a book for its cover alone? Which one? Yes! 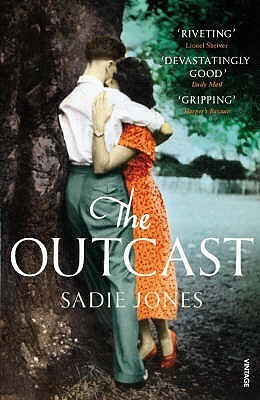 The book is called The Outcast (by Sadie Jones). I bought it, because the man and the woman on the cover reminded my of Tom Hiddleston and Rachel Weisz from the movie 'The Deep Blue Sea' which I adore. In the end I liked the story too, in spite of the fact that it was very depressive. If you could choose one book to live in, which one would it be? Can you imagine yourself as the hero of a book? If yes, what genre your book would be? Do you/Did you struggle with compulsory readings? What books will you read to your kids? What were your favourite bedtime stories? Do you read in other languages than English? What was the most influential book that you've ever read? As you can see I'm currently reading Daniel Deronda by George Eliot (among other things). I admire this book; truly, I'm obsessed with it. 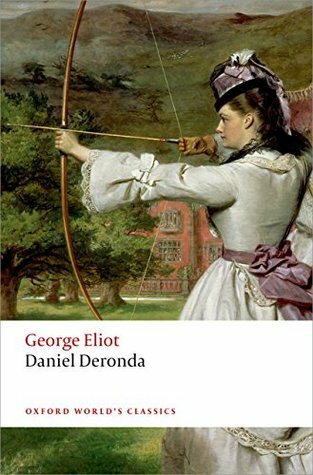 George Eliot's writing style is amazing (this is the first Eliot book I've ever read) and the story is fascinating – I never knew Jews were so frowned upon in Victorian England (too). Also, I might or might not be a little bit in love with Daniel. I thought I'd share some of my favourite quotes with you. I'm only halfway through the book, so there might be another post coming later with another bunch of quotes. Enjoy! "Development and catastrophe can often be measured by nothing clumsier than the moment-hand." "Attempts at description are stupid: who can all at once describe a human being? Even when he is presented to us we only begin that knowledge of his appearance which must be completed by innumerable impressions under differing circumstances. We recognize the alphabet; we are not sure of the language." "One couldn't carry on life comfortably without a little blindness to the fact that everything had been said better than we can put it ourselves." – not the will to inflict injuries and climb over them as a ladder, but a hatred of all injury." "Outsiders might have been more apt to think that Klesmer's position was dangerous for himself if Miss Arrowpoint had been an acknowledged beauty; not taking into account that the most powerful of all beauty is that which reveals itself after sympathy and not before it." "There is a great deal of unmapped country within us which would have to be taken into account in an explanation of our gusts and storms." "I think I dislike what I don't like more than I like what I like." I received a free ebook copy of this book from the author via NetGalley in exchange for an honest review. This action packed sequel of True Calling just didn’t work for me. I had my issues with the first book and I had high hopes that the second one will win me over, but it didn’t. The plot, I like. It is fast paced and many things happen, the conspiracies and secrets that come to light from time to time are engaging. I could almost overlook the fact that there are too many elements drawn in from other popular YA books, too. But… the thing is, the love triangle became too much for me in this instalment. One quarter of the book was basically like an emotional ping-pong match with Ariana and Zane playing on one side and Cal on the other, and another quarter was the same only with Cal playing next to Ari. And it was tiring to ’watch’ to be honest. Too bad, because new interesting characters were introduced and the book ended with a cliff-hanger – which bugs me, because at the moment I’m not planning to pick up the last book in the series.